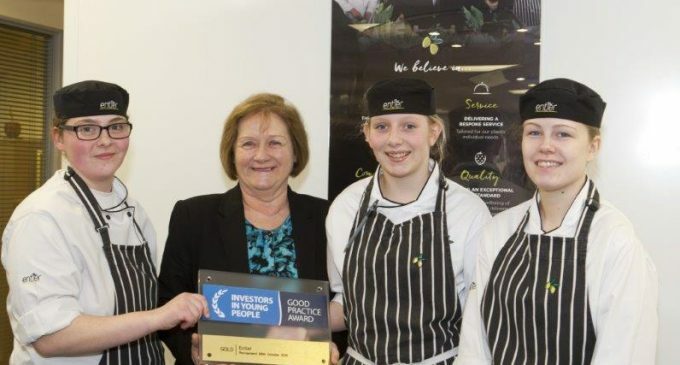 An Aberdeen catering company and CIS Excellence Awards sponsor was presented with Investors in Young People (IIYP) Gold accreditation last week during a visit by the Scottish Government’s Minister for Public Health, Maureen Watt. During her visit, Maureen (pictured with, L-R, Fresh Olives Alix Frost, Jack Brimmer and Vicky Smith), said: ‘Scottish Apprenticeship Week is about showcasing the positive impact that apprenticeships have on businesses and industry, and the value they bring to employers and to their own job prospects. One of only two companies in the North East – and thirteen in Scotland – to achieve IIYP at gold level – Entier’s Fresh Olives apprenticeship programme demonstrates commitment to nurturing young talent and helping to secure the next generation’s workforce.